In some ways, this is a perfect title. Here is what will be “lost” if you decide to see this movie: your time, the price of admission, the cost of transportation to get there, any other expenses you have. Oh, but this is a huge waste of time – and everything else. And here are six more opinions: I saw it on a Monday night, and when the film began, there were seven people – including me – in the theatre. Not a big audience, but not bad for a Monday. But then, two left. Then one more. Then another couple. And then the older guy sitting up front got up and walked out. We were forty minutes into the movie and I was the only one in the theatre. And none of the others came back. Yeah, it’s that boring. How can that be? It was directed by J.C. Chandor, who made the great “Margin Call” just two years ago. 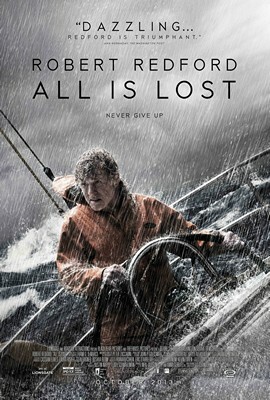 And this movie stars Robert Redford, who has made a whole bunch of terrific movies along the way. This is not his best performance, although it may be his version of a silent movie. For the entire 106 minutes, he’s the only person on screen and, with the exception of a brief monologue at the beginning – and the calling in of an SOS and an angry expletive midway through this film — he says nothing in the movie. It’s all man against the sea, with sound effects and music. There’s no backstory, no side stories, nothing to add interest. And so we sit there with him in a small boat, watching, waiting, wondering when this is going to end. The answer: Not soon enough.